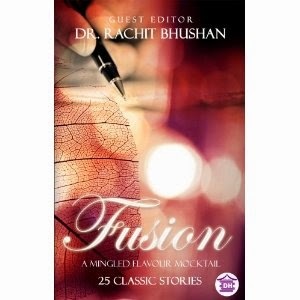 Blurb: It is an anthology which consists of 25 such stories that will steal your heart away. It is not just a book but a journey of emotions that will take you for a roller coaster ride. With every page you turn, words will strike the chord of feelings and emotions will grip you in a manner that you won't feel like keeping the book aside till you reach the end. Verdict: The wonderfully designed cover will definitely turn the heads of the readers and the name suits the theme of this anthology. The story of the heir was something that I believe to be the perfect start to the book. Along with the pain and agonies, it surely shows what in real a society is. How we base and conclude everything on the basis of pure assumptions. It left me speechless at the end. The story meant for every girl, Shreya has done her best in writing the story. It teaches everyone to stand up and fight the world for their well-being and not being selfish. It surely is the dance of life. The third story of the book. The story of a ‘stranger’ calling another ‘stranger’ and talking to her on a rainy day is quite interesting to read. A blend of emotions, the feeling inside the story remains one of its plus points. the most eye catching thing about the story was the narrating style. The thought process behind the story has been commendable. I would salute the writer for penning down a story of a physically challenged mother and daughter. Undoubtedly one of the best. A story that also shows us what the evil side of the social networking sites can be; it teaches us that one should not trust someone so easily. Written in a very lucid language, the story gives us a wonderful moral at the end. This story of Anand and Shalini is mostly about long lost love in the hands of society and their coming back on one fateful journey, how the twilight is of importance and what happens thereafter is what the story is all about. I liked the narrating style of the author. Having read so many love stories in the book, this story just added to the feel. A very wonderful story of a guy from Lahore, Nayontaara and her best friend. This story is bound to bring brings tears. Just a few errors were avoidable. The story has done its best in defining love with the wonderful and meaningful couplet in the beginning of the story. Though I felt that so many conversations marred the feeling of the story. This story, though a light read has much to offer. In comparison, a bit low but still it gives the readers a nice time with it. I felt that it could’ve been written in a much better way. Lost love? Love that was left unsaid. The story of Raksha and Rajeev is this and much more. Full of emotions and strong feelings, a nice describing style adding the cherry on the cake, it is a must read. Another form of love written in a very unique and interesting way, this story has a lot to offer in one plate. Rajbeer and the housewife- the story has different things to teach. The presentation is the main attraction. The story where good prevails over evil, the fight of injustice and justice. The way the story has been described was really well. Though I felt that even more drama would’ve made this story a potboiler. blind folded in love? What happens then? The side effects of not telling anyone about it and the consequences. This story has it all. In a nice narrating style, there were some silly mistakes in it; but a nice one time read. The lost ‘male’ support after the death of her father and finding solace in new ‘social networking’ friends, was the story of Nikita. Akshay was different in itself. What happens when they meet is something the readers would love to know. A few punctuation errors marred the feel of the story but above all, a nice read. To me, I would like to term it a page turner. A daughter in need of help in a big city and an unknown stranger helping her in it. Yes, the story shows human nature in two sides. A one stretch scene with an exceptional description leaves the readers wanting for more. Given the title of the story, it is yet an unusual story with a very different approach. A perfect page turner, it gave me Goosebumps while flipping the pages. Through the eyes of old parents, it is undoubtedly the best and a must read. Such encounters can happen any time in our lifetime. That incomplete love; or the person who left you, without saying anything. The writer gives this and much more. There were a few typing errors; but apart from that a nice read. I liked the way the story has been etched in a wonderful way. Written in a very precise way, the story was also a very nice one. Though I felt that a bit more interesting plot would’ve enhanced the feel of the story. Simplicity is a very important form of human kind. The kanchas being one of the simplest people around. The story depicts the simplicity of those people. If written in a more interesting way, it could’ve grabbed the reader’s attention for long. First of all, I would like to congratulate the writer for opting for such a topic. The feeling of homosexuality is very nicely written in the story. One surely has tears at the end. A story which does its best in promoting both music and politics. In an enriching and whole new format, this was one great read. Though, I personally dislike the use of any particular party’s name; apart from that, a nice read. The anguish by an unwanted relation, the trauma of divorce, unsaid love, and friendship. This was the story of Anu and Sarthak in a few words. The end, though, was predictable. All in all, it was a nice read. I always have had a fetish for murder mysteries and this writer has given us just that. In a very sweet and simple way, it surely gives the mystery a nice touch. I really liked the narrating style. This is probably one story which I don’t want to speak much about. Sitting here I am speechless after reading it. Everything was so perfect about it. The narrating style, descriptions. It stays with you much after keeping the book down. The story of Menaka. Prostituon. How two lives are 2 sides of the same coin? Everything is written here. I would term it as an answer to all questions. What happens when they meet and at the end? This story brings upon a perfect end. The fusion of wonderfully etched stories have given this book a whole new meaning. Mehek Bassi, Nikhil Chandwani and Ishita Bhown being the star attractions of the book. The punctuation and grammatical errors were few but they weren’t able to mar the feel of the book.